Wangi Wangi is a beautiful sleepy hollow one and a half hours north of Sydney on the shores of the huge tidal Lake Macquarie. 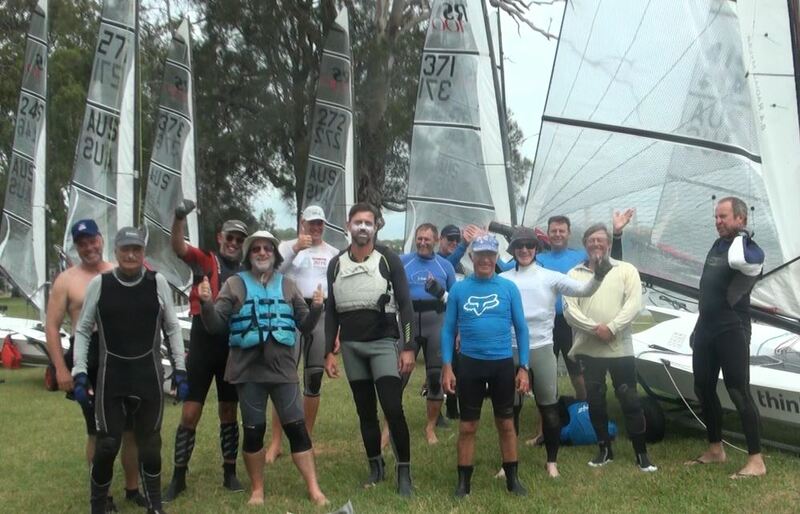 Wangi RSL Amateur Sailing Club stage many national events and are well experienced. The Sailing Club set up area is a huge lawn, with beers available from cool boxes, sited adjacent to the RSL club. The original entry list of 16 was unfortunately reduced to 14 a week out when two Victorian sailors withdrew due to injuries. Sailors, ranging in age from 17 through to late sixties, have come from southern NSW, northern NSW and Melbourne. There are some pictures of the action plus we hope to be able to post some drone footage as well. Race 1 – 10-11 knots from the east, moving NE. Good start with slight committee boat favour, Peter Coleman and Stuart Lyons pushed out during first beat and held through to the first gate. The 2nd beat saw a shift to the NE and favoured those going left. With Stuart sailing the centre of the course he took the lead at the windward mark hotly followed by a fast Pete Coleman. A bunch of 5 sailors then rounded including Duncan Dey who, at 65kg and in his 60s, had only ever sailed against two other RS100s before. Paul Tadich and Duncan gybed and went to the left with more pressure while others went right. The gate was hectic with boats taking both marks, however with Duncan and Paul took the right gate and had a nice shift into the line allowing Duncan to get the bullet, Paul Tadich 2nd. Unfortunately Stuart was OCS so Pete Coleman was 3rd. Dave (Dizzy) Williams in his new boat out of plastic (519) was next, but he was also OCS which put Zac in 4th, Tom Le Grice in 5th and Vince Selleck in 6th. Slight pin end favour and the wind increased to about 13-14 knots from the Nor East. The line was hampered with a minute to go with random capsizes. This start was a general recall due to over-zealous sailors at the pin led by Rob Morton. Second start went away with no fuss. Dave Williams sailed beautifully up the middle of the course to have a good lead at the windward mark and was not challenged for the rest of the race. Solid works and downwind legs by Stuart Lyons and Paul T stamped their authority on the regatta, with new lad, 17 year old Zac Heuchmer from Ballina coming in 4th and Vince also from Ballina 5th. The wind stayed in the Nor East, but increased marginally, increasing by the end of the race to around 16 knots with plenty of white caps. However the skies were blue and temperature stayed around 32 degrees. Just fantastic RS100 sailing conditions! These fresher winds suddenly showed weaknesses in the fleets ability to gybe consistently with capsizes at both ends of the fleet, most notably from race leader Vince S and Zac H and later from Dave W and Stuart L. Zac had a huge lead at the first mark putting his 196cm and 105kg frame to full advantage but an error on first downwind allowed Dizzy (DW) through. However, by the end of the 2nd work the top 7 boats all rounded the mark within 20 seconds. The pressure got to Vince (in the lead) and he threw in a needless gybe and sadly tipped it in as Paul T took his wind. Zac H was now up and running and got through Paul T (2nd)to score his first bullet, with a tight finish thereafter: Zac’s Dad Bill (new to RS) came in 3rd, Stuart Lyons 4th and Dizzy 5th with Rob Morton sailing “Forty Two” 6th. Three windward/leeward set for the course. The fleet got off cleanly with a small pin end favour. Zac took the pin end and cracked off with speed, using his weight and height, to have a large lead at the first mark. The drone hovered overhead taking footage as we all worked on speed and keeping the boat flat in a small but consistent chop. The chase group around windward mark was roughly Dizzy, Ross, Stuart, Vince, Paul and Tom. A small but legitimate tack by Le Grice at the windward mark caused carnage and confusion with the next five boats behind. There were boats in irons, hitting marks, port starboards, loud voices...... while Paul and Tom continued on their merry way. This is what National Titles are about! The wind increased significantly throughout the race. Sadly Ross, lying in 3rd – missed the toe straps, forgot to release his extension and broke it, forcing him ashore and missing races 4 and 5. 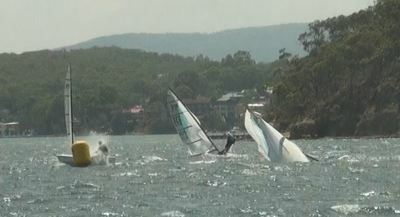 Other capsizes and turtles started on lap 2 and 3. After a short postponement the RS100 fleet again got away cleanly on a slight pin end favour. Williams and Lyons in the middle of the line did well. Zac at the pin along with Vince, Tom and Rob also got away well. Peter Coleman and Paul started closer to the committee boat, got clear air, and were in contention up the first work. Order of the day was “flat is fast”. Zac, Dizzy and Rob did this best hitting the end of the first work 1 in that order. The first major drama came at the leeward gate. Rob must have been reading books on whales breaching up and up out of the water, for this is what he did with “forty two” at the left gate mark ! (see pictures) all to the amazement of Stuart, Paul and Tom. We all narrowly missed Rob but his heart may well have stopped briefly as he looked up and saw three RS100s hurtling towards his bow and navigating the 4metres between him and the mark. Paul put “Too Hot” in the drink three times at one mark. He dropped the kite early, gybed, the main loaded up, the kite fell out the chute and he kept putting it in leaving him out of the running. Wow. A race that will live with many of us for some time to come for a multitude of different reason which I will try to retell here. This race was set for two windward returns which was very welcome as some of us were cramping up. The start line turned out to be pretty well biased, with Zac tacking on port on the gun at the pin and crossing the fleet. Vince and Tom also got away to fliers. First beat rolled into one of Zac (again), Vince, Dizzy, Peter Jackson (sailing his new boat 317), Lyons, Le Grice, Tadich and Bill H at the windward mark. The leeward gate was tight fast and frenetic, with Le Grice eventually going over after a mix up. Dizzy fell out of the boat, after missing his foot straps, on his final work putting him back three spots. Vince and Zac both hit marks and did their 360 turns. In the guts of the race Rob Morton again did a triple pirouette while navigating down-wind with the kite up, almost taking out three other helms (all of whom played safe and did Grannies) and then , comically hit the gate and fell in the drink big time! Two amazing things in this race occurred, other than Zac getting his 3rd bullet for the day. Peter Jackson sailing his first RS100 regatta went around two laps, including a work to the line, with a total of five tacks, no kite hoists, no gybes and took a 3rd overall. Now I know these are fun boats to sail in 20-25 knts with a kite but this was real risk mitigation played out for a great result. Hat off to you Peter. The Lyon (Stuart) – sailed the race superbly in the footsteps of Zac, lying 2nd and …wait for it…. Just five metres from the finish he tacks for the line gets his feet tangled in the mainsheet, tips it in and ends up 5th! Heart goes out to you mate, but laughing at the same time! Hardest bit of the day was the fifteen minute sail back, downwind, to the club. Brett Bowden – mate… we made it in eventually brothers in arms – wet soggy and exhausted! Early start on the last day at 11 am. The wind is up to 12 knots and building at 9am, sky overcast and the temperature forecast between 29 to 33 degrees. “We sail to Win, but we all love to sail” – a good Chris Walker Aussie Quote going back some years – and how true this is in this small but grand RS100 Aussie fleet of boat owners. Committee boat favoured. A number of boats approached line early and were forced down the line. Yet again… Zac sped off (as he did in all 3 races on day 2) from the leeward end of the fleet on what appeared to be a tight reach , with speed and a flat boat powering through the waves. 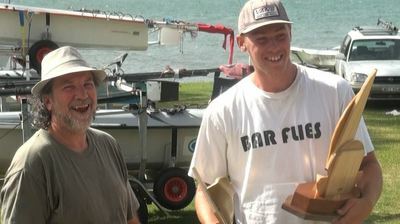 At the windward mark there were the usual characters plus today a surprise in Zac’s dad Bill being in the mix. So roughly it was: Bill, Zac, Stu, Paul, Dizzy, Vince followed by the mid fleet battle of Tom, Peter C, Rob M, Pete J and Duncan. Sadly Ross’s boat started some very uncanny manoeuvres part way up the first beat – which left him scratching his head. Suddenly his bow nose-dived and emerged a full minute later, with Ross clinging to his transom. He made a desperate run for the shore and spent 25 minutes removing water from his hull and was done for the day. It was caused by a mast step failure. With the wind ever increasing to conditions akin to Saturdaty afternoon, the lake a-flood with white caps and big gusts hitting hard and repeatedly , one felt that this was our own small version of the Volvo Ocean 60s! We all sat huddled in our dinghies eating and drinking while Dizzy kindly did a belly flop off his boat and swam to help Pete C who turtled his boat and was breathless. We all waited until Dave and Pete were ready and the Committee kindly delayed the start until all were aboard boats and accounted for. The start was very similar to race 7 with Duncan and Tom flying in for a timely committee boat start while the rest of the fleet slid down the line. The first work was a dog fight between Lyon, Tadich, Williamson, Selleck and Le Grice with Zac out in front. Bill put his boat in on the windward mark and some faltering by Dizzy bought him back to the bunch. The rear guard of the fleet were beginning to follow Peter Jacksons lead from the previous day, running kite-less which is good seamanship but hard for some of us to cope with. Hence we had the situation of mid fleeters in Rob M, Tom and Bill flying kites and gybing and swimming battling those not using their kites. Needless to say the kite-less lot (generally) won hands down in both races 8 and 9 this afternoon. Race 8 top 6 finish ended: 1. Zac (this wrapped up the National title for Zac who recorded 4,4,1,1,1,1,1,1 DNS: 14 pts), 2.Paul, 3. Stuart, 4. Vince, 5. Dizzy in Will Power and 6. Bill. The remarkable thing about these wee great race dinghies is their amazing strength and durability through these Wangi winds and also the Port Philip rolling waves, surfs and thumps through the chop (the Ross mast step issue is the first I have heard of such a failure). Over this long weekend – the helmsman and boats have plugged away remarkably, while the F15s that have also been tacing had a broken carbon mast and many bruised crew. There have been no spar, sail, rope or hull damage, with the exception of the one discussed here. It was fabulous to see our eldest helm in the fleet, Brett Bowden “Sea Dog” persevere with a difficult capsize and then pop him-self back into his boat , and push on for his ninth race and an 8th position. With Zac sitting out Race 9, the fleet got off cleanly with the mainsheets being worked over time now as the breeze kept hovering up and down from 20-25 kts. Boom vang on, boom vang off, on again and hike, hike, relax momentarily, hike again, work those quads, calves, abs and fore-arms. Fingers cramping, not moving, stuck closed, main off main off, main on main on, keep her flat, power, watch the waves, watch the boat angle, bear off and work on speed. Phew! First down wind I counted four upturned white hulls at the gybe position. OK, kite down, Granny, gentle gentle, bear away, kite back up, whoosh, wobble, whoosh, ropes the hot water spray. Don’t really know what went on at the front as I was swimming and trying to improve my downwind sailing, loving every minute. Over again, hit the plate, up up, back in quickly, kite back into chutes in under 2.5 seconds, done, off again. Heart rate up big time with Paul Tadich recording 160 peak. Duncan, as a man in your 60s, and at 65kg, how well did you go in these winds? Awesome and relentless. Peter Coleman, the half block RS100 model prizes are just magnificent, all 10 of them, colour coded Gold, Silver and Bronze. Thank you. Brett Bowden, your authored book donated to each participant “Sailing to Win” will be read from cover to cover through February and will sit next to my Paul Elvstrom books and Eric Twiname’s “Start to Win”. Thank you. 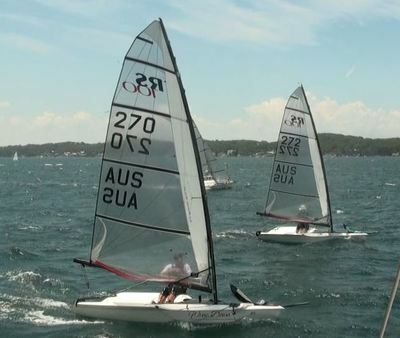 The 2019 Nationals will be held at Port Stevens NSW during the Australia Day weekend. Let the planning begin! Maybe some Europeans might come to experience sailing down under. A clean start The gang's all here Vince and Bill Vince with winner Zac Heuchmer A broach or a breach?